Harka Bahadur Chhetri today dropped hints that he was not averse to joining another party, and Trinamul senior leader Partha Chatterjee added fuel to the speculation fire by saying "the matter is being handled by our leader". This morning, Chhetri said he would be writing his resignation letter to the president of the Gorkha Janmukti Morcha Bimal Gurung. Late this evening, Gurung said he had not received any letter from the Kalimpong MLA. "I shall remain an Independent MLA. But in the future I can join any party, say the CPM, Congress, BJP or Trinamul," Chhetri said, when asked outside the Assembly which party he would join. When Trinamul secretary-general Chatterjee was asked if Chhetri would join the ruling party, he told The Telegraph over phone: "Since the matter is being handled by our leader (Mamata Banerjee), she is in a better position to throw light on it." During Mamata Banerjee's trip to Kalimpong earlier this week, Chhetri met her on Monday night, although all other Morcha leaders kept away from government events that Mamata presided over. A Trinamul source close to the chief minister said Chhetri had discussed his "possible switch to the party" during the Kalimpong chat. When asked why he went to meet Mamata in Kalimpong, the MLA cited propriety. "She is our chief minister and since she was visiting my constituency, it was part of my duty to meet her." Gurung, who returned from Delhi today, said he had "no inkling" about the resignation as he has "not received anything in writing" in this regard. "I feel that if he (Chhetri) has anything to say or make any decision, he should send us the details in writing, instead of making verbal statements," Gurung said at Bagdogra after landing from Delhi. Asked about Chhetri's allegations of his "autocratic" way of functioning, Gurung said: "Have I duped people? I have run the party in a completely democratic manner, with the sole focus on development in the hills. Now if anybody raises questions about the party's functioning and on my way of running it, it will be unfortunate. He had won the people's vote. Now if he makes any decision, it is up to the people to decide how they consider his decision." Technically, Chhetri can stay on as an Independent MLA as it will not go against the anti-defection law. The law is applicable when the number of legislators defecting is less than one-third the strength of that particular party in the House. As there are only three MLAs of the Morcha in the sitting Assembly, Chhetri alone makes up one-third strength. Also, the anti-defection law kicks after the party requests the expulsion of the defectors and the Speaker assents to the request. Two other Morcha MLAs - Trilok Dewan from Darjeeling and Rohit Sharma from Kurseong - who were to resign today, skipped the session and would resign on Monday. Morcha chief Bimal Gurung had said the MLAs would resign from the Bengal Assembly as a move to renew the Gorkhaland agitation. The resignations are also the Morcha's stance to protest what the Morcha thinks is the meddlesome nature of the state government in affairs of the GTA. 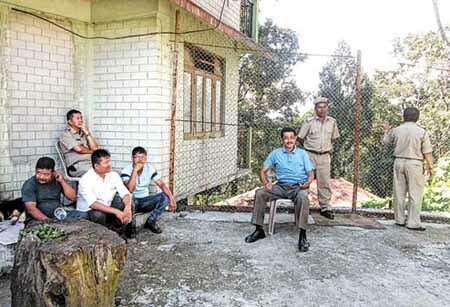 Today, the Darjeeling district administration posted several policemen outside Chhetri's house - the MLA generally moves around with one police guard. Chhetri, 58, criticised the Morcha leadership for its current stand-off with the state government. "A working relationship with the state government is necessary to get development work done in the hills. But those at the helm in the party do not agree with me," he said. He repeated, without mentioning Gurung by name, that it was "unilaterally" decided the MLAs must resign, without taking the legislators into confidence. "The decision on the resignations from the House was taken unilaterally by those at the helm in Morcha without my consent. Besides, on several issues, I am not being consulted. In fact, the situation has come to such a pass that one cannot remain in the party with self respect," he said. "My protest is against this autocratic style of functioning," he said. Chhetri had said earlier that he wanted Kalimpong subdivision to be made a district, an issue that could push the Morcha to the back foot as the district demand may find resonance among residents of the subdivision. The Morcha's rivals in the hills said Chhetri leaving would be a setback for the hill's most powerful party, but they also said the MLA couldn't be absolved of all the blame of the "mess" the party had made in the hills. Pratap Khati, the president of the Akhil Bharatiya Gorkha League, said: "By leaving the party responsible for the mess that the hills have turned into, Chhetri cannot hope to absolve himself of any guilt. He and Bimal Gurung are equally responsible, and the people should not forgive either of them." Khati said it was Chhetri who had said that he would leave the Morcha if it compromised on the Gorkhaland demand, but later, he became the the most vocal defender of the GTA.